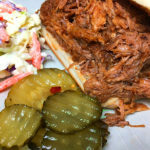 The most amazing, tender, juicy and delicious Instant Pot pulled pork recipe. 1/2 – 1 cup of your favorite BBQ sauce. Trim fat from pork roast and cut into 4 same size chunks. Add all dry ingredients to a large bowl and whisk together. Add pork roast chunks to rub mix and coat well. Add 2 tbs olive oil to Instant Pot and set to saute. Once it indicates hot, add 2 pieces of the pork. Sear on each side for about 2 minutes each. Remove pork and set aside on a plate. Repeat with remaining pork pieces. Once pork is seared and removed from pot, press cancel and add 1/2 cup chicken broth. Use a wooden spoon and deglaze the bottom of the pot. Make sure to scrape up all the bits. Then add remaining chicken broth. Worcestershire sauce and liquid smoke. Place pork chunks directly into the liquid in the pot, spacing out as best possible. Secure lid and make sure vent is set to sealing. Pressure cook/manual on high pressure for 60 minutes.Then let pressure release naturally for 20 minutes or until pin drops. Remove pork to a large bowl and shred with 2 forks. Add you favorite BBQ sauce as desired.